There is a body of sinusitis clinical research that indicates that fungus may play a role in sinusitis. Antifungal treatments have been used, but so far the results have been mixed. Considering how many people get sinusitis every year it would save millions from suffering if we could find better ways to prevent and treat sinusitis. There are ongoing sinusitis clinical trials that always need participants. Some trials focus on medications while others are looking at manual ways to help relieve sinusitis. Participation in sinusitis clinical trials is at no cost to you. 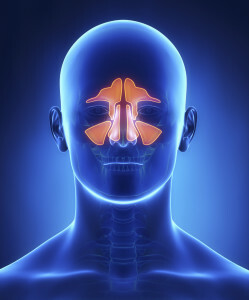 Sinusitis is when the paranasal sinuses (air filled spaces within the nasal cavity) become infected. An infection, an allergy or autoimmune issues can cause this. Sinusitis is viral and in acute cases usually lasts around ten days. There are 24 million cases of sinusitis in the U.S. each year and 90% of adults suffer from it at one point in their lives. Chronic sinusitis is defined as sinusitis that lasts more than eight weeks. Symptoms include congestion, pain, headache, coughing with a thick discharge, and trouble smelling. The causes of chronic sinusitis include allergies, a deviated septum or exposure to second hand smoke. Acute sinusitis treatment often involves over the counter nasal irrigations and decongestants. Since it is viral antibiotics will not do any good, but in some cases where the sinusitis lasts more than 10 days antibiotics are prescribed. Corticosteroids are also sometimes used in sinusitis treatment. Treating chronic sinusitis that has not responded to other therapies can sometimes involve surgery. Functional endoscopic sinus surgery involves removing obstructions in the sinuses to restore their natural openings. Another surgery is balloon sinuplasty where a balloon is inserted and inflated to unclog the sinuses. Allergy & Asthma Clinical Research, Inc.